Breighton was one of Yorkshires Bomber stations, construction started in 1941. It was situated on the South side of the A63 road close to the village of Bubwith which was in the North West corner. 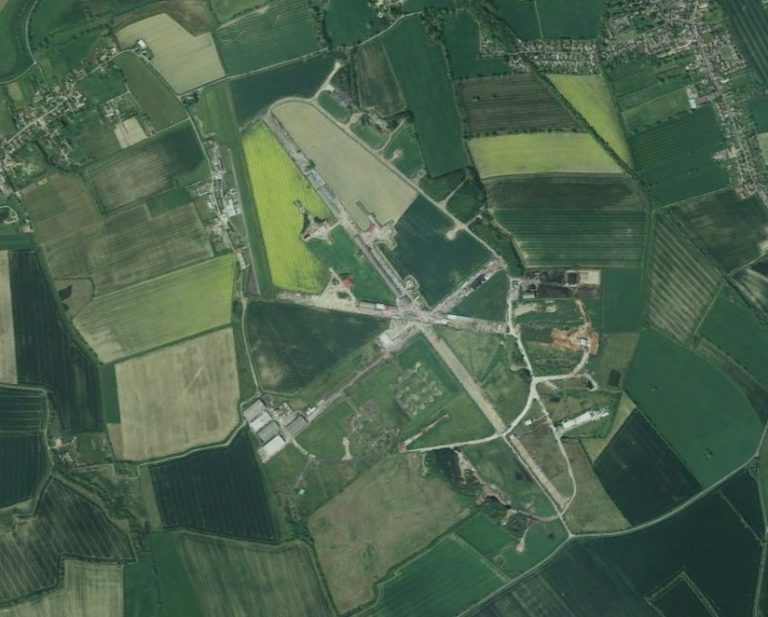 The b1228 road formed the eastern boundary and in the south west corner nestled the little village of Breighton which give its name to the airfield. It was a standard bomber airfield with three runways, but these were very unusual as they had a common intersection. 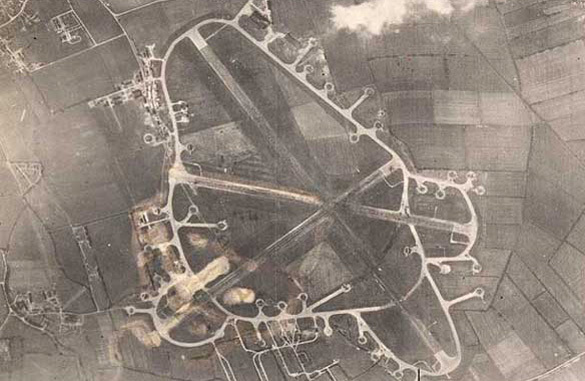 The runways were encircled by a perimeter track around which were a number of ‘frying pan’ type dispersals. The technical site in the North West corner was provided with two hangers and there was a further ‘T2’ on the southern boundary. All three runways were subsequently lengthened to class A standards by extensions on their eastern ends, the main runway being on an east – west axis and stretching to the B1228 road. The perimeter track was also extended and further hardstandings were added. Breighton opened in January 1942 in No 1 Group Bomber Command, as a satellite for Holme-on-Spalding Moor. The first to take up residence was 460 Squadron RAAF. Which arrived that same month from Molesworth, Huntingdonshire. This unit’s code letters ‘UV’ but later changed to ‘AR’ was equipped with Wellington MK IVs. Although classed as an RAAF squadron there were only 38 Australian among the aircrew. After a short working up period the squadron began operations on 12th / 13th March 1942 when five of its aircraft were dispatched to Emden. Not a successful start, however, for only one believed it bombed Emden the other did not know where they had bombed, and one failed to return. On 15th September 1942, the resident unit was withdrawn for re-arming with four engine bombers. The squadron now had on strength 66 Australian aircrew members which were 50% of the requirements. Preliminary training was already under way for 460 Squadron Conversion Flight had been formed during August 1942 with Halifax aircraft and had moved immediately to Holme-on-Spalding moor so that operations could continue from Breighton, but these became less and less because lost aircraft were not replaced. The Wellingtons was being Phased out of Bomber Command operations and when only five remained with 460 Squadron they were transferred to No 142 Squadron at Waltham which still operated with Wellingtons. On 1st September, Wing Commander K.W. Kaufman, DFC, took over command of 460 Squadron and on the 26th September the conversion flight returned and replaced its Halifaxes with four Lancaster’s and four Manchester’s. Three fatal crashes during air-firing and bombing tests marred the period of conversion but nevertheless by the end of October the squadron had reached a high degree of proficiency with the new aircraft and was now ready for operations with its new Lancaster’s. On 7th October 1942, No 460 Conversion Flight merged with 103 Conversion Flight from Elsham Wolds into No 1656 Heavy Conversion unit, Code letters ‘BL’ and ‘EK’, which was officially formed here on the 10th October under wing Commander Hubbard. On 26th October 1942 it moved to Lindholme. No 460 Squadron had only just returned to operations when, on 23rd November , Kaufman was forced through illness to hand over his command to Wing Commander J.F Dilworth, DFC, who remained at the head until 16th February 1943 when Wing Commander C.E Martin took over 460 Squadron. He was the first Empire Air Training scheme graduate to command a heavy-bomber squadron. 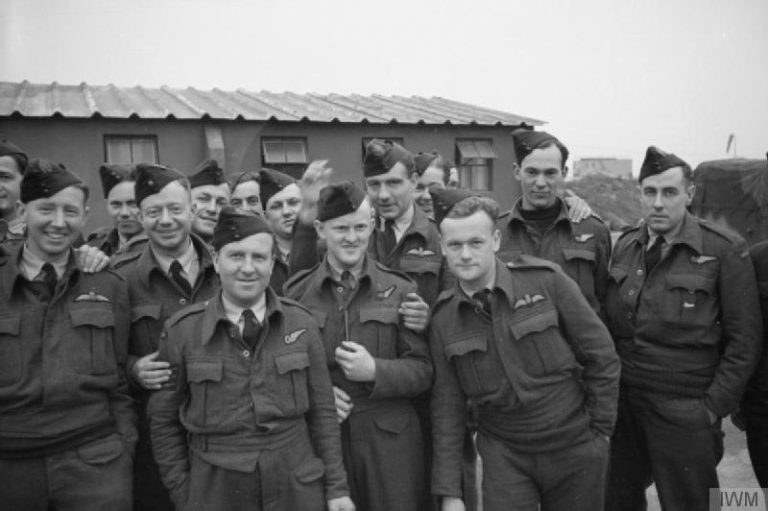 On 14th May 1943, the resident squadron moved to Binbrooke in Lincolnshire. The move took place by air and there was no interruption to operations. In June 1943 Breighton was transformed into No 4 Group Bomber Command and on 16th June No 78 Squadron arrived from Linton-on-Ouse. This was a Halifax squadron and Breighton was to remain its base for the remainder of the war. No 78 Squadron took part in the many major raids including the epic raid on the Peenemunde experimental rocket base on 17th/18th August 1943 when 23 of its bombers bombed from 7000ft. It also took part in attacking the invasion targets which included the marshalling yards at Le Mans, Lille, Juvisy and Trappes. The squadron also attacked the coastal gun battery at Mont Fleury on the night of 5th / 6th June 1944 in direct support of the Allied landings. 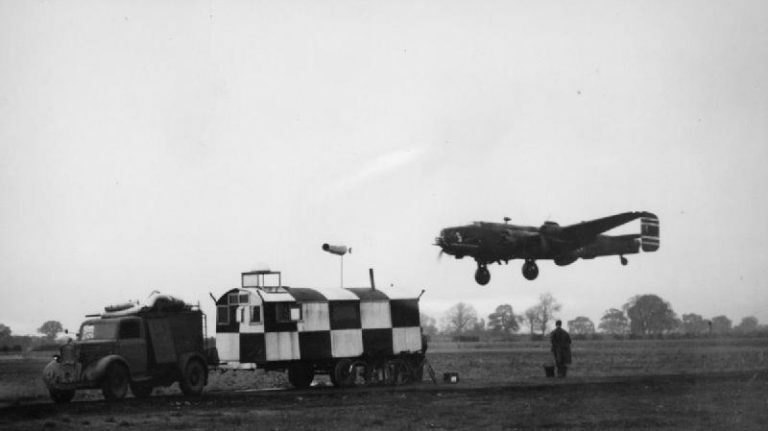 A Halifax III of No 78 Squadron comes in to land at Breighton, passing the airfield control trailer, after the first daylight raid on Essen, 25 October 1944. Mont Fleury was one of No 4 Group’s targets and a force of 124 bombers was dispatched with 522 tons of bombs. The casemates at Mont Fleury were believed to hold Russian 122mm guns but in fact only one gun was installed. German security was certainly very good. Along with other squadrons No 78 bombed at just after 04.30 hours on 6th June but it was a waste of time for the gun was only slightly damaged and during the assault it fired until captured by ground forces. After the Normandy invasions the Breighton bombers continued to give support with attacks on German troops in the Caen and Falaise areas. The New Year brought bad weather conditions and during January 1945 the squadron was only able to make nine operations. During the spring they bombed targets in support of Allied thrust into Germany. By April a few Halifax B VI’s became available, but not great numbers and the last operational mission was on 25th April 1945, when 20 Halifaxes bombed gun batteries on the island of Wangerooge. 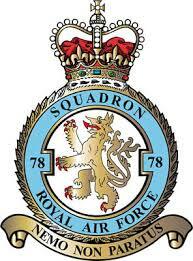 The squadrons war effort comprised 6017 bombing sorties and 320 mine laying sorties with a loss of 182 aircraft. It dropped approximately 17,000 tons of bombs and destroyed 31 enemy aircraft. On 7th May 1945 along with the rest of No 4 Group squadrons it transferred to transport command and operated Halifax MK VI’s in the transport role until converting to Dakotas in July 1945. No 78 Squadron moved to Egypt in September 1945 and the following year the station was abandoned by the RAF. and industrial site occupies the one time technical area. One ‘T2’ hanger is intact and used for storing wood by timber importers. The Butts and water tower are still there as a reminder of those wartime days and the east-west runway is used by crop spraying light aircraft. The site was re-used between 1959 and 1963 as the location of a Thor IRBM site and Bloodhound missiles provided air defence.